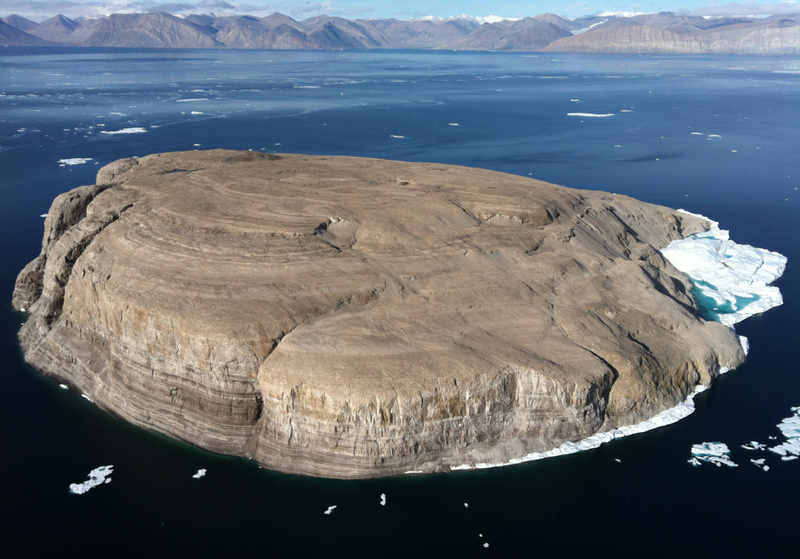 Hans Island is a small, uninhabited island that is just 1.3 km2 long and 1.199 km wide, located in the centre of the Kennedy Channel of Nares Strait—the strait that separates Ellesmere Island from northern Greenland and connects Baffin Bay with the Lincoln Sea. Hans Island is placed within the territorial waters of both Canada and Denmark. As a result both Canada and Denmark have claimed sovereignty over the island. The island has likely been part of Inuit hunting grounds since the 14th century. In 1972, a team consisting of personnel from the Canadian Hydrographic Service and Danish personnel working in the Nares Strait determined the geographic coordinates for Hans Island. During negotiations between Canada and Denmark on their maritime boundary in 1973, both states claimed that Hans Island was part of their territory. No agreement was reached between the two governments on the issue. On November 29, 2012 Canada and Denmark settled an agreement on the exact border between them, however without defining the border near Hans Island.